We return to our ongoing series of compromised Brooklyn signage with this example of signs that have been relocated to accommodate buildings construction. We continue to assume that this is a totally legitimate thing because it happens so frequently, but we might suggest to the city that stop signs that are several feet higher than where people expect to find them and somewhat hidden one-way signs are not necessarily a good thing. Just saying. 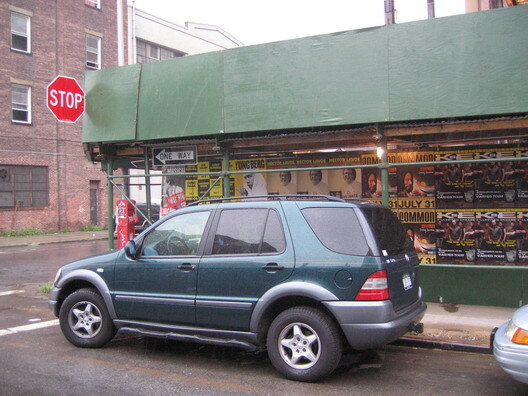 Last year there was a sidewalk shed obstructing the "WALK" sign at the SE corner of 8th Ave. and St. John's, facing 8th (just before Flatbush, an intersection where drivers often speed to make that left). I contacted "311" several times and couldn't get a straight answer whether this was a Transportation or Buildings issue (each said it was the other) and the problem was only solved when the shed came down. It's fairly clear there's no enforcement, even if this is illegal. The Transportation commissioner lived a couple of blocks away at the time.